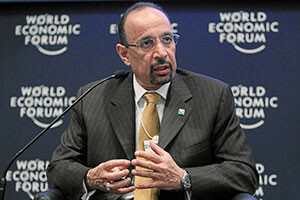 Saudi Arabian Energy Minister Khalid Al Falih. Saudi Arabia, OPEC's de facto leader, put an impossible informal deal on the table today ahead of the cartel's official meeting on Wednesday. The kingdom claimed it would cut 4.5% from its production levels if Iran agreed to freeze its oil manufacturing at about 3.8 million barrels per day as well. On top of that, Riyadh stipulated that there must also be participation in cuts from producers outside of OPEC, such as Russia. But these requests are hardly realistic given the fact that they were presented more as ultimatums to two of Saudi Arabia's biggest competitors ahead of formal talks. For instance, Iran has only been producing since January, when sanctions against its nuclear program were lifted. Not surprisingly, the country rebuffed the kingdom's tough standards this morning by stating it should have the opportunity to continue profiting from oil production for the time being. Tehran also said it believes only those countries responsible for having ramped up production over the past two years — Saudi Arabia and its Gulf allies — should cut production now. As far as Russia — which remains to be the largest oil exporter in the world — is concerned, Putin admitted on Nov. 18 that his country was willing to hold its production steady, but he stopped short of agreeing to cut output altogether. Not only did Saudi Arabia's proposal today seem preemptively demanding of oil producers with which it should be trying to compromise diplomatically, it also heightened global concerns about the country's ultimate uncooperativeness at Wednesday's big powwow. That's because, just yesterday, the country's Energy Minister Khalid Al-Falih told state-run media that he thinks "the [oil] market will reach balance in 2017 even if there is no intervention by OPEC," reported The Financial Times today. "I think maintaining production at current levels is justifiable," he added. "It may well be that Al-Falih is setting the stage to blame Trump if OPEC fails to agree on a production cap in Vienna at the end of the month," Moors predicted on Nov. 22. "Al-Falih has already criticized President-elect Trump for his position on oil imports."